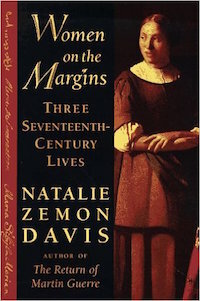 As she did in The Return of Martin Guerre, Natalie Zemon Davis here retrieves individual lives from historical obscurity to give us a window onto the early modern world. As women living in the seventeenth century, Glikl bas Judah Leib, Marie de l’Incarnation, and Maria Sibylla Merian, equally remarkable though very different, were not queens or noblewomen, their every move publicly noted. Rather, they were living “on the margins” in seventeenth-century Europe, North America, and South America. Yet these women—one Jewish, one Catholic, one Protestant—left behind memoirs and writings that make for a spellbinding tale and that, in Davis’ deft narrative, tell us more about the life of early modern Europe than many an official history. All these women were originally city folk. Glikl bas Judah Leib was a merchant of Hamburg and Metz whose Yiddish autobiography blends folktales with anecdotes about her two marriages, her twelve children, and her business. Marie de l’Incarnation, widowed young, became a mystic visionary among the Ursuline sisters and cofounder of the first Christian school for Amerindian women in North America. Her letters are a rich source of information about the Huron, Algonquin, Montagnais, and Iroquois peoples of Quebec. Maria Sibylla Merian, a German painter and naturalist, produced an innovative work on tropical insects based on lore she gathered from the Carib, Arawak, and African women of Suriname. Along the way she abandoned her husband to join a radical Protestant sect in the Netherlands. Drawing on Glikl’s memoirs, Marie’s autobiography and correspondence, and Maria’s writings on entomology and botany, Davis brings these women to vibrant life. She reconstructs the divergent paths their stories took, and at the same time shows us each amid the common challenges and influences of the time—childrearing, religion, an outpouring of vernacular literature—and in relation to men. The resulting triptych suggests the range of experience, self-consciousness, and expression possible in seventeenth-century Europe and its outposts. It also shows how persons removed from the centers of power and learning ventured in novel directions, modifying in their own way Europe’s troubled and ambivalent relations with other “marginal” peoples.